The final series have been completed today with race eleven and twelve at the 470 Class Junior World Championships for men/mixed and women. The title cannot be taken away anymore from Sofian BOUVET and Jeremie MION (FRA), whilst Tara Pacheco and Berta Betanzos (ESP) still have a tough job to secure the women’s title in tomorrow’s medal race. 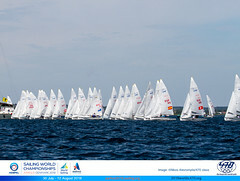 Sofian BOUVET and Jeremie MION (FRA) have claimed the Junior World’s title before the medal race has taken place. By safely scoring two fourth places in today’s races, they end the day with an undefeatable 39 points lead. Crews from Italy, Argentina and Great Britain, who threatened their leading position the most during the last few days, tried hard to make a last move to get into a favorable position for the medal race tomorrow. However, the chasing crews reached an opposite result and scored well below average, and opened the door for Ferdinand GERZ and Tobias BOLDUAN from Germany and Vianney GUILBAUD and Thomas HADDOUCHE from France to take their places, close to silver and bronze. “There was less wind in the first race, and more shifty We had a bad start and we had to work hard to get back on top. We finished fourth. The second race was more windy and was much easier for us. We made a good start, took the left side, which was the good one, and also ended fourth. We have the title already, but we will still try our best in the medal race tomorrow,” Sofian BOUVET said. “We started the first race today in a prosperous third overall position. It was quite a difficult day, with difficult conditions of very light, shifty winds. We didn’t make serious mistakes, but in the end we didn’t manage to get the results we hoped for. We were stable during the event, but since yesterday our results went backwards, with a tenth position and an OCS, which was our first serious mistake. Still, we have chances for the bronze medal tomorrow.” commented the Argentinean crew Santiago MASSERONI. The battle for the gold medal in the women’s 470 will be fierce tomorrow. 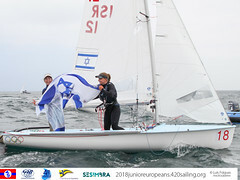 Tara PACHECO and Berta BETANZOS (ESP) have been leading the women’s event from the start of the event, and today they solidified their position with a second and fourth position, to go into the medal race with a twelve points margin on the chasing Gil COHEN and Dana Mamrievfrom Israel. The Israelis ended the final series today with a third place and a bullet, and so increase the pressure on the Spanish ladies. Also Victoria JURCZOK and Josephine BACH (GER) were confident today to increase their chances for a title or a medal and dominated the women’s fleet by scoring a bullet and a second place in race 11 and 12 respectively. 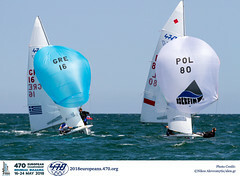 BOCHMAN and LORENZ (GER) also needed good results today to stay connected to Spain, Israel and the German team of JURCZOK and BACH, but rounded the first mark in the middle of the fleet. With some strong downwind performance they managed to finish in fourth position, and improved in today’s last race in third position, enough to have chances for a medal tomorrow, however gold seems out of reach. “The Israelis took some points on us. Although its a small amount, in the end it can be a lot. Also Victoria Jurczok and Josephine Bach have come closer. They are really fast in these light winds.” Berta BETANZOS said. Tomorrow’s racing in the women’s medal race will not only be about the strongest sailors, also preparation and mental strength will play major roles. “Tonight we have a meeting with our coach and we will review the situation for the medal race tomorrow.” Tara PACHECOsaid. The medal races will start directly after the last fleet races which are scheduled for 1300.